Ramblings of an Opinionated Bong...: Are Manchester United fans going overboard with the supposed superiority of Januzaj over Sterling? In life situations arise when the less deserving person gets to hog the limelight more than the person who actually deserves it. Fame is something for which a person has to be not only performing well, but also be at the right place at the right time. 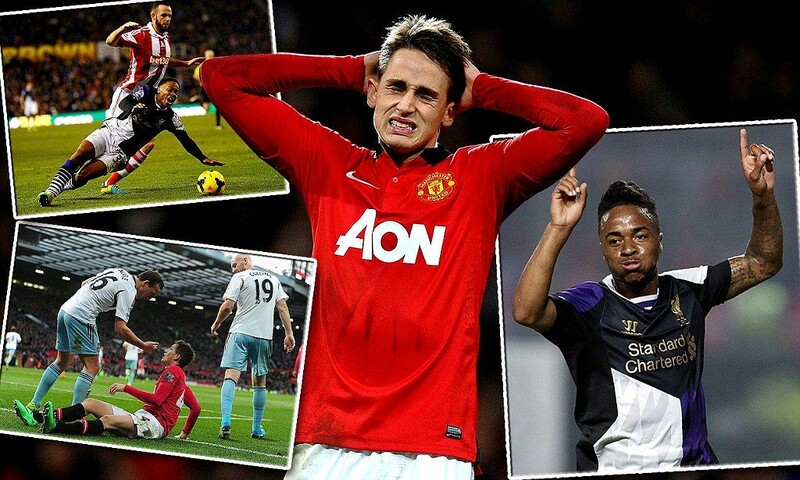 For now it seems like it has been the exact case with Manchester United midfielder Adnan Januzaj and Liverpool youngster Raheem Sterling. This season has been about Januzaj and how he has inspired United to fight their way back. He has certainly been the best thing for United fans to brag about, prior to the Mata transfer of course, and the supporters have made the tallest of claims about him. On the other hand, Raheem Sterling’s advent has been much demure this season. The fanaticism surrounding him has been absolutely non existent compared to the last season and he has somewhat got lost beneath the remarkable achievements of Luis Suarez and Daniel Sturridge, the new SAS. We are nowhere claiming that Januzaj is not talented, on the contrary we believe that United has introduced the world to a premium talent, who in course of time could be one of the top players of the world. But our main aim is to argue that Januzaj has received the overwhelming praises from all quarters not only because of his on-field displays, but also for the sheer reason that United have lacked any other inspiring stories so far in the season. Januzaj has been like an oasis in the desert for them and they are leaving no stone unturned to capitalize on their brightest star. First let us make it absolutely clear that while both of the players are of the same age, Sterling actually is a season older to the Belgian, with him making his debut previous term and also making quite an impact last season under Rodgers. Januzaj is relatively new to the hustle and bustle of Premier League and we can safely say that he is still adjusting to the demands of the league. But let us get some statistics about both the youngsters and then try and make our claim (Stats Source: Squawka). Both of them play in the midfield of the team and it is a must for them to be precise with their passes and help their strikers. We are unable to differentiate the two players in this respect with Sterling completing an average 81% of his passes, compared to Januzaj’s pass completion of 80%. 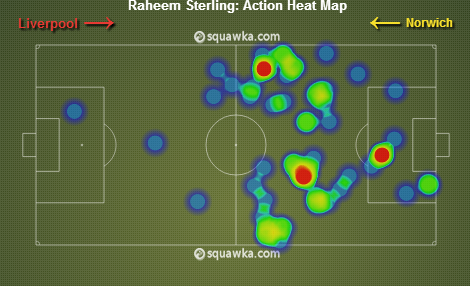 Below we provide the heat map of Raheem Sterling from the game against Norwich. We can clearly see his dominance all over the pitch, something which demonstrates his tremendous work rate. He has been one of the main reasons of Liverpool’s dominance in the midfield in that game and this kind of work-rate only allows players like Luis Suarez and Sturridge to shine even more. Throughout the season, he has been the unsung hero for the Kopites and now we can see why Brendan Rodgers was desperate to get him to sign a long time contract last season. On the other hand Januzaj has been more central in his role, displaying a lower work-rate, mainly focusing on his strengths. We can confirm this if we take a look at his heat map from the game against Sunderland, his best game so far this season. For a person of Sterling’s small stature, it is quite a feat to keep up with the big defenders and even out-muscle them. He has done that on a regular basis winning 62% of his take-ons. Januzaj, on the other hand, has not been successful in more than 54% of the occasions. 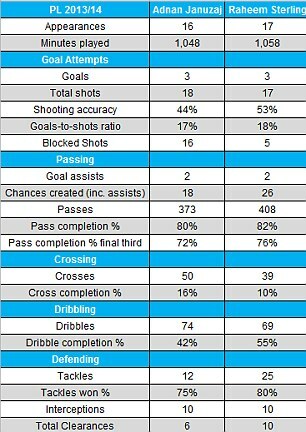 Below we provide the statistics of both the players respectively to validate our point. Having said all these, we can say with the utmost confidence that both these players are extremely gifted and it is too early to jump into any conclusions. Both have their own style of playing and both are huge assets to their respective club and national team. If morning shows the day, then the future definitely looks bright for the English Premier League and its fans. Just that, at this point of time, Sterling is as good as Januzaj and it is rather unfortunate that the Belgian is stealing the headlines while his English counterpart is doing his job silently in a SAS dominated world.